Protect your sensitive electronic devices from power surges and spikes with the 8-Outlet Surge Protector with 12-ft. Cord. This 3550-joule surge suppressor features eight surge-protected outlets with sliding safety covers to provide premium power protection for your professional workstations, laser printers, broadband modems, home theater systems and everyday household electronics. Simply plug the 12-foot cord into any AC wall outlet and connect your devices to keep them safe from surges, lightning strikes and AC contamination. 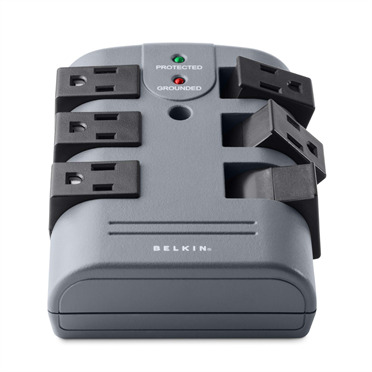 With the Belkin eight-outlet surge protector, you never have to worry about power spikes, storms, voltage fluctuations, or transient electricity damaging your valuable devices. 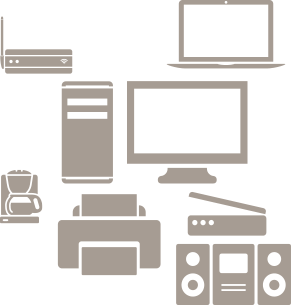 Intelligent built-in voltage sensing circuitry detects and responds to your device's power needs, while safety features, such as thermal fuses that turn off your system in the event of a severe occurrence, ensure your devices are protected. 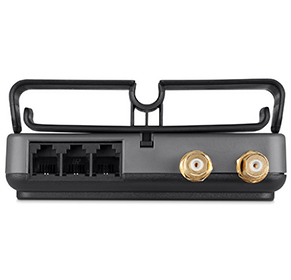 This surge protector also reduces electromagnetic interference (EMI) and radio frequency interference (RFI) to block unwanted line noise up to 58 dB, ensuring better performance of connected equipment. It also helps prevent equipment lockup. 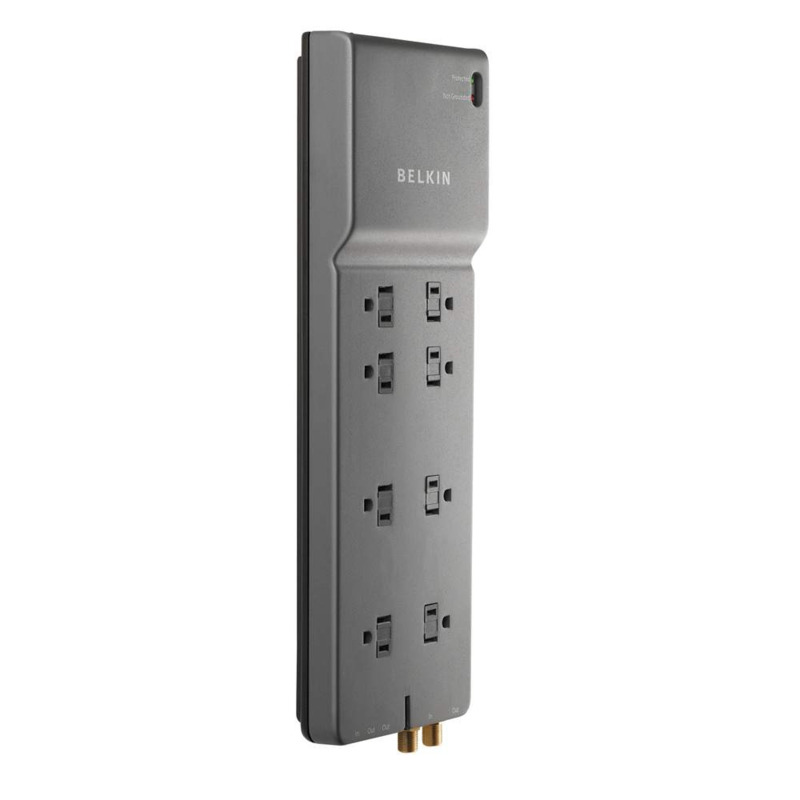 Ideal for homes, offices, entertainment centers, or any room with multiple electronic devices, this Belkin eight-outlet power strip has a slim space-saving design. 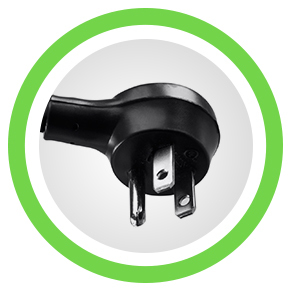 The low-profile right-angle plug fits easily in tight spaces and behind furniture. 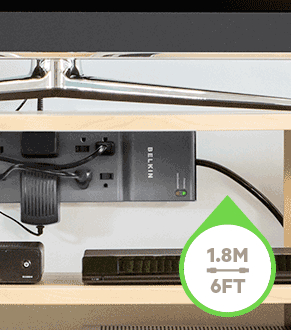 Plus, the integrated cord management bar lifts and locks to keep cords and cables organized and out of the way. 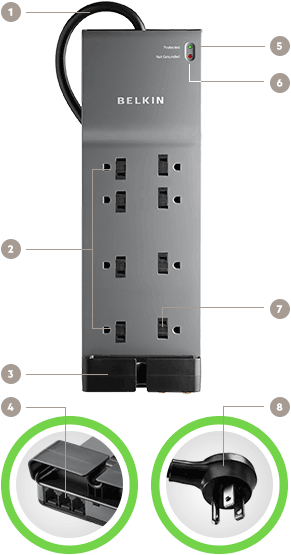 The 8-Outlet Surge Protector with 12-ft. Cord features a ceramic arrester that protects coaxial cables in cable box/satellite connections. This eight-outlet surge protector also offers telephone/fax line protection to ensure open and continuous phone line connections. 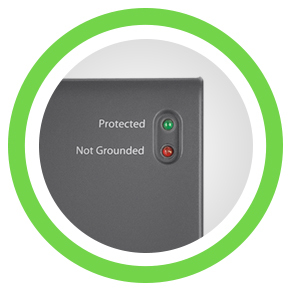 The 8-Outlet Surge Protector with 12-ft. Cord features a green "protected" indicator to let you know your equipment is secure, while the red "not grounded" indicator warns you when the electrical wiring is not properly grounded. The surge protector comes in a durable impact-resistant ABS case that protects ciruits from fire, damage and rust. 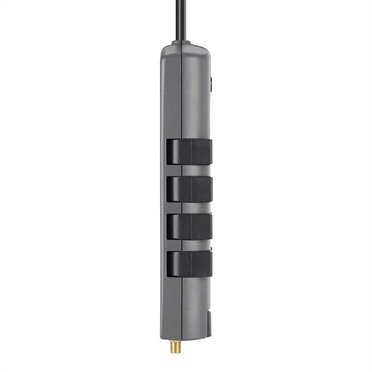 The 12-foot, 14-gauge power cord ensures optimal power flow to connected devices while keeping your Belkin surge protector out of the way. This surge protector comes with a Limited Lifetime Product Warranty and a $200,000 Connected Equipment Warranty. 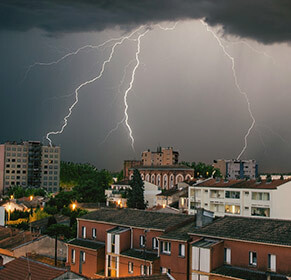 Belkin will repair or replace electronic equipment damaged by an electrical surge or a lightning strike while properly connected to the Belkin surge protector, up to $200,000.